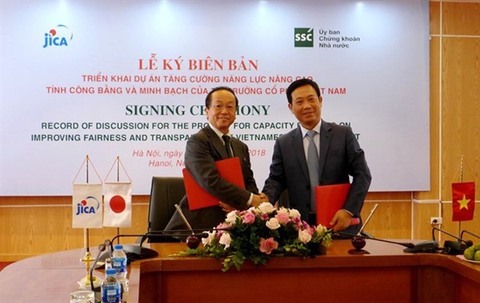 The State Securities Commission (SSC) and the Japan International Co-operation Agency (JICA) on Monday signed a project agreement to improve the quality, transparency and equality of the Vietnamese stock market. JICA will help the SSC and the two local exchanges – the Ho Chi Minh Stock Exchange and the Ha Noi Stock Exchange – will raise their capacity in monitoring the stock market and market members, managing the share listing and issuance, and raising awareness of local companies over protecting their investors. The project is developed as an addition to Viet Nam’s plan on securities market development for 2012-20 that was approved by the Prime Minister in 2012, targeting to make the Vietnamese market integrate into regional and international markets. The Vietnamese stock market has been developing for more than 18 years and its value has reached 80 per cent of the country’s gross domestic product (GDP), SSC chairman Tran Van Dung said at the signing ceremony. The bond market accounts for 30 per cent of GDP, including 22 per cent contribution from the government bond market, Dung added. Therefore, he said the combined value of Viet Nam’s stock and bond markets has exceeded the economy’s GDP. The Vietnamese securities market has received assistance from Japanese partners, including stock exchanges and financial institutions, Dung said. Dung hoped the project would help the SSC and the two local exchanges develop a sustainable Vietnamese securities market, thus strengthening the confidence of Japanese investors in the assets. According to Konaka Tetsuo, JICA chief representative in Viet Nam, the Vietnamese securities market has room to grow in the future in terms of both volume and value.